FILE - In this photo provided by the Syrian Civil Defense group known as the White Helmets, a destroyed ambulance is seen outside the Syrian Civil Defense main center after airstrikes in Ansari neighborhood in the rebel-held part of eastern Aleppo, Syria, Sept. 23, 2016. Ambulances have been intentionally and repeatedly targeted in Syria, researchers said Tuesday, calling for more efforts to protect medical workers caught up in the conflict. The research, in the peer-reviewed journal BMJ Global Health, analyzed reports of 243 attacks on ambulances in 2016 and 2017 and found more than half were deliberately targeted. "There is no ambiguity in the results: Ambulances are directly and repeatedly targeted in Syria," Hayes Wong, one of the authors of the report, told Reuters. 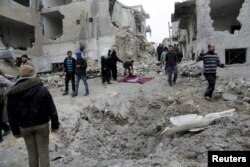 The attacks studied were mostly in opposition-held enclaves in and around Aleppo, Idlib and Damascus and nearly 90 percent were carried out by Syrian government forces and their Russian allies, the paper said. FILE - Residents inspect a crater at a site hit by what activists said were three consecutive airstrikes carried out by the Russian air force, the last which hit an ambulance, in the rebel-controlled area of Maaret al-Numan town in Idlib province, Syria, Jan. 12, 2016. There have been repeated reports of attacks on medical workers and health care facilities during Syria's eight-year conflict, even though both are protected by international law. Among the most prominent medical workers in Syria are the White Helmet rescue workers. The group, who say they are neutral, have been credited in the West with saving thousands of people in rebel-held areas. Syrian President Bashar al-Assad and his backers accuse them of acting as propaganda tools and proxies of Islamist-led insurgents. Almost half the ambulances that were attacked were severely damaged or destroyed, potentially hampering efforts to help casualties, researchers said. The World Health Organization (WHO) said the report highlighted the dangers to health workers in Syria. "WHO reiterates its call to all parties to Syrian conflict to remember their humanity, abide by their legal obligations under international humanitarian law, and respect the sanctity and safety of health facilities and health workers," spokesman Tarik Jasarevic told Reuters. The WHO said 97 health workers were killed in 137 attacks in Syria this year, according to reports collated by its monitoring tool for attacks on health care. It does not collect data on who is responsible.